← Do You Have a Story, or a Situation? I’m disappointed by the lukewarm reviews for Jurassic World: Fallen Kingdom, because I think Jurassic World is one of 2015’s two best encapsulations of the themes of Laudato Si. In case you’re not the type to cite papal encyclicals on a regular basis, Laudato Si: On Care for Our Common Home was Pope Francis’ first encyclical and came out in May 2015. It’s typically described as “the climate change encyclical” . . . but it’s so much more than that. 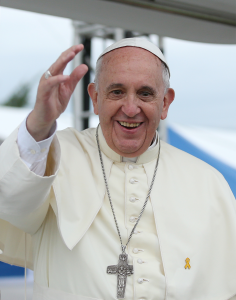 Although care for the environment is the primary theme of the encyclical (and it goes well beyond climate change, throwing in deforestation, deliberate hunting of endangered animals, pollution, and just about any environmental theme you can name), Pope Francis also issues a scathing critique of consumerism and “throw-away culture.” We abuse the Earth because we see it, not as a beautiful home that God created for us and entrusted to our care, but as a system of resources to exploit. That mentality, Pope Francis argues, inevitably causes us to treat our fellow human beings as things to be used as well. If we end our exploitation of the environment, we take a step toward ending our exploitation of the poor, the unborn, the elderly, the disabled, people of other races or ethnicities . . . everyone. Coincidentally, 2015 also brought us a pair of movies that perfectly encapsulated the themes of an encyclical that the creators couldn’t have read beforehand (unless George Miller and Colin Trevorrow have precognitive powers). The best, hands down, was Mad Max: Fury Road. In fact, after reading Laudato Si, I commented that “We are not things!” would actually work as well for a subtitle as “On Care For Our Common Home.” Many other writers have alluded to how perfectly Fury Road sums up a hellish world that cares nothing for the Earth or the people who live there except as means to an end. It should headline any Laudato Si film festival. And, yes, I genuinely think Jurassic World should be in that film festival, too. I want to make it clear that Jurassic World is nowhere close to Mad Max in terms of thematic richness. You could talk about Mad Max for hours without getting to the bottom of the all its ideas, or even all its connections to Laudato Si specifically. (Who would have thought that a movie with a flame-throwing guitar would be so dang smart?) Jurassic World is a popcorn movie about a dinosaur slugfest. Nonetheless, it offers a positive counterpoint to the bleakness of Mad Max. Mad Max gives us a world gone wrong; Jurassic World gives an idea of what a world gone right might look like. Mad Max, helpfully summing up Laudato Si in four words. “Ever more limited and gray”–those words might haunt me more than any others in the encyclical. Sorry, Indominus, but the Pope says real dinosaurs are better. As a whole, the scientists of Jurassic World tend to treat Indominus and the other dinosaurs as “things” instead of living creatures (there’s Mad Max again). This is most obvious in the way that they talk about the dinosaurs, referring to them as “assets” and using the pronoun “it.” (Compare to Chris Pratt’s Owen Grady–who we’ll get to in a minute–who consistently calls them “animals” and refers to them as “she” or “her”). 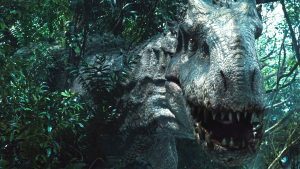 Additionally, Indominus is raised alone in captivity, which the movie implies is the root of her viciousness (Trevorrow confirmed this in an interview with io9, comparing her to a real-life example of a tiger that escaped captivity and went on a killing spree). The scientists aren’t thinking about her needs as a living creature; they’re just thinking of what will be the most cost-efficient way to present their attraction. Once again, Pope Francis has their number. In paragraph 33, he reminds us that “it is not enough . . . to think of different species merely as potential ‘resources’ [or assets?] to be exploited, while overlooking the fact that they have value in themselves.” The Pope is saying this in context of extinction, reminding us that all creatures give glory to God whether they provide some tangible benefit or not, but it’s also a useful reminder for anyone who works with animals. Even if they happen to be cloned dinosaurs. We need a model of a proper relationship with nature in order to imagine how stewardship of creation might look. And that’s where Owen Grady comes in. Owen and his pack of clever girls. 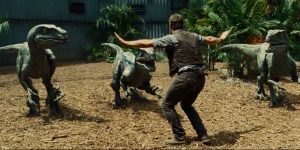 Owen Grady, the velociraptor trainer, gives us that model of an ordered relationship with nature. He isn’t some Poison Ivy-style extremist who hopes that the raptors will devour those worthless nature-hating humans; he loves and respects the raptors as living creatures, but would never sic one on a fellow human being. 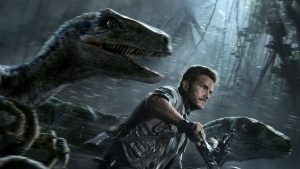 Trevorrow’s version of raptor social structure is familiar to anyone who’s studied wolves or dogs–they hunt in packs, with an alpha at the lead. Grady has earned the respect of the raptors and established himself as their alpha, and this works for the betterment of both the raptors (who have the healthy social structure that their instincts demand) and the humans (who know the pack alpha doesn’t want to eat their faces). Of course, there’s no point in Laudato Si where Pope Francis says, “By the way, if we ever clone velociraptors, you should respect their pack dynamic while keeping humans safe.” (He does point out that the idea of having “dominion over every animal that moves upon the Earth” should be understood as a “mutual responsibility” with humans “caring, protecting, overseeing and preserving” those creatures, but green theologians have been pointing that out for decades.) However, throughout the encyclical, Pope Francis repeats the ideas of relationship and equilibrium. Humans are meant to be in equilibrium with nature, living neither as Captain Planet villains nor as ecoterrorists; humans are also meant to have a proper relationship with nature, understanding and loving it instead of seeing it as something separate from ourselves. In turn, this will lead to greater equilibrium within human societies and stronger relationships with our fellow humans. It’s not hard to see the principles of equilibrium and relationship with nature in Grady. Grady’s dominion over the velociraptors is rooted in his relationship with them as animals, not as assets (and animals with humanizing pronouns at that); it’s also rooted in his desire to see humans and animals in proper equilibrium, with humans as neither helpless prey nor corporate predators. If you live in equilibrium with nature, you can be this awesome. Sadly, Jurassic World doesn’t extend these themes to equilibrium and relationship with human society, which is part of why it can’t match Mad Max in Laudato Si perfection. (The film has the opportunity to explore this with Claire Dearing, whose disordered relationship to the “assets” is a reflection of her disordered relationship to her sister’s family, but it never develops that beyond a shopworn “workaholic needs to enjoy the better things” story.) Still, it remains one of the few environmental movies that seems to love people of good will as much as it loves nature, and shows us what “people of good will” might look like. Instead of pitting humanity against animals, it shows them working together in harmony–and gives us cool dinosaur fights in the process. For that, it’s always going to have a place on my Laudato Si viewing list. This entry was posted in Catholicism, Movies, Spec fic. Bookmark the permalink.